FR Hugh Thomas’ spiritual life has ebbed and flowed like the tide in 46 years of the priesthood. “I’ve had my times of lesser enthusiasm, but I think I was affected by some false ideas going around in the 1970s and 1980s,” the Redemptorist priest said after a recent visit to Brisbane. “I got caught up in a number of those things. “My praying before the Blessed Sacrament pretty much stopped, my praying the Rosary stopped, various things. Fr Thomas is now enthusiastically supporting Blessed Pope John Paul II’s call and Pope Benedict’s support for perpetual adoration chapels to be set up across the world. “It’s the fastest growing movement in the Church,” he said. He said there were less than 20 perpetual adoration centres across the world in 1989 and now there were more than 3000. Brisbane’s own Perpetual Adoration Chapel, run by the Sisters of Perpetual Adoration and lay adorers, is counted among that number and Fr Thomas recently gave retreats to adorers and at other parishes across Brisbane and Toowoomba, and to young people at Faith on Tap. “I was very pleased with the trip to Brisbane, there’s a lot of enthusiasm for adoration,” Fr Thomas said. “It’s been going there for three years and you need to have a bit of a boost and there is the hope it could spread to more than one parish. Fr Thomas’ journey to the priesthood and religious life began just after conception. “The idea of being a priest was always in my mind, I had two uncles as priest, and one of them became the bishop of Geraldton,” he said. “So it was in the family and when I was still in the womb my grandmother on my father’s side told my mother the greatest joy she could have would be to have a priest son. “So they all started praying and my Mum got her mother praying … so two grandmothers and a mother praying for a priest in the family. I never had a chance. “I always wanted to be a priest from a little boy, but being a Redemptorist was more about reading about missions in the Philippines. “Interestingly I was very interested in reading The Far East, a Columban magazine, but the Redemptorists also had missions in the Philippines at that time and I was interested in that. “Not that I would necessarily have gone to the Philippines, but to my joy that was my first appointment after I was ordained and I was sent there for twenty-two-and-a-half years. During his years in the Philippines, Fr Thomas had a roving mission going from village to village preaching, administering the sacraments and training lay leaders. “I spent my 23 years going around to barrios, the villages, and preaching to people there who were Catholic but without the great opportunities the people in the towns,” he said. “Today it’s completely reversed with young Filipino priest coming down the Australia. “Some dioceses are recruiting quite a lot from there. “Our congregation is recruiting from Vietnam now. Our students in Melbourne are all from Vietnam; they are gifted to us by the Vietnamese province where they have huge numbers of vocations. “Their seminary is bursting at the seams, as it is in Indonesia and Kerala. After returning from the Philippines Fr Thomas completed 12 years in Western Australia, where he conducted many retreats and parish missions. For the past seven years he has spent a couple of months each year in Indonesia and Singapore giving retreats to priests and promoting adoration of the Blessed Sacrament. With Fr Doug Harris, a diocesan priest of Perth, he has helped establish 30 chapels of perpetual Eucharistic adoration in different islands of Indonesia. “I suppose there is nothing that would match the joy I get in going to Indonesia and giving priest retreats and seeing the response of the people,” he said. “You’re speaking to 1000 people about adoration and it’s a great joy. “You see 5000 people at the opening of a chapel by the archbishop. “There is such a tremendous response. You see all these people praying, not just one or two, but 30 or 40 praying in an adoration chapel. “I don’t’ think anything could match that experience. Fr Thomas described the life of an overseas missionary as “a rewarding experience”. “It is so different today, the 1960s Church into which I was ordained is so different from today’s Church,” he said. 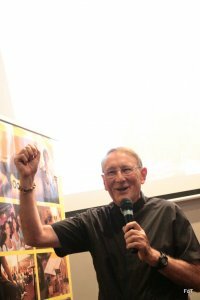 “There were many young Australian vocations in those days, we had about 50 young Australian Redemptorists in the Philippines alone. “And there were many other missionaries from the Jesuits, MSC’s, Marists and so on. Despite the changing dynamics of religious life, Fr Thomas will continue on his mission to promote perpetual adoration across Australia and across the world.